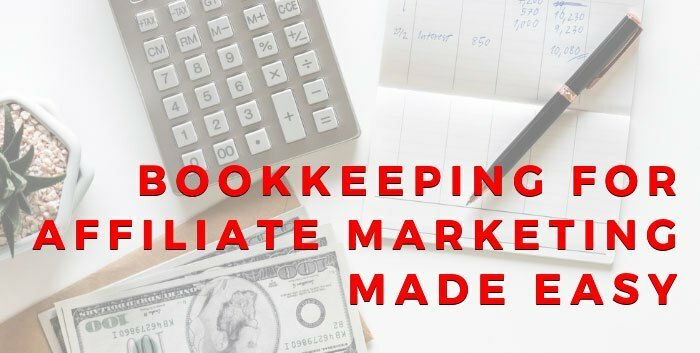 Today I'll show you an easy bookkeeping method for small business, specifically for those who are new to affiliate marketing. I am (was!) an accountant with 25+ years of bookkeeping experience, and have seen countless number of fellow online marketers struggle to keep up with their financial transactions. But really, there's nothing complicated. Particularly if the majority of your income is from affiliate commissions, it couldn't be simpler. I said it was a 'method' but there's nothing special. Use an online bookkeeping tool. But only use a part of it - the key is not to overcomplicate anything. I use a free tool called "Wave". I actually use it myself and use it for my tax return, since my source of income is solely via online. Just a little disclaimer first; Accounting standards and tax regulations vary from country to country and I'm just an accountant from the UK. I'm in no way suggesting anything to hide or mislead the authority in your country. Keep your transactions as transparent as possible in case of being questioned. Minimize The Number Of Categories! Google it and you'll find some companies who allow you to have a new card for a very low fee. I have one called Pockit Mastercard but that's for UK residents. Check the transaction fees though - some charge you every time you spend, some charge you a fixed monthly fee. The idea is to transfer a lump sum from your personal account to your new prepaid account periodically. (This will be your "equity".) Then make any business-related payments on your card. As the card balance becomes lower, top it up. How much to transfer and how often depend on the level of expenditure. If your monthly total spend (online tools, membership fees, advertising costs etc.) is $100, perhaps transfer $300 from your personal account to this card account every quarterly. You'll only need a bank account if the only option to receive your affiliate commission is via wire transfer or by check, not by PayPal. Even so, your prepaid card account #1 above should be attached to the card issuer's bank and you might have your own account number. If that's the case you don't need it. Otherwise you want a separate bank account that you're not using for anything else for. Any type of account as long as it allows you to deposit and withdraw freely throughout the year. If you don't have one, you can ask your bank to open one. They are unlikely to open a business account for you so easily, but many of them will be happily open an extra account. You'll definitely need a separate PayPal account for business transactions. Check this one ("Can I Have Multiple PayPal Accounts?") and open new one if you haven't already. Okay, so Wave is simple but proper accounting software for small business owners. It doesn't have budget planning feature, which often makes many users hard to keep up with, so it's great it doesn't have it. Simple is best. I will only focus on your income and expenditure for the current year. My aim here is to simplify as much as I can, and still make it useful for your year-end tax return. Just keep in mind that the software will allow you to record so much more in detail if you want it to. Balance Sheet (means how much money you've got) - I'll ignore that too. I'll be happy to answer your questions. When you first sign up with Wave, it will ask you to choose what kind of business that you do from the dropdown menu. Choose 'Marketing' or 'SEO' or something similar. It will also ask you the country of your business. You need to set it to your country and your local currency, even if all your receiving income is in US Dollars. This is important in order to be able to use Wave for tax return, and also important because once it's set, you won't be able to change it. You can post any foreign currencies in Wave, but the default currency should be your own. Now you're in Wave dashboard. In the left-hand menu, you'll see "Sales" and "Purchases" - completely ignore these two. Very useful (to make sure not to miss payments/receipts) but you don't need those for affiliate marketing. Go straight to "Settings" at the bottom-left corner. Then "Dates & Currency". Your currency should be set to yours and cannot be changed as I just mentioned. Your Fiscal Year - you can decide your business tax year for any period you like, but I strongly suggest that you stick to your personal tax year. January 1st - December 31st in USA as I understand. So make sure the fiscal year end is set to December 31. 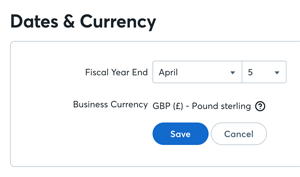 I live in the UK and our tax year runs from 6th April - 5th April over here. (Odd? Yeah!) If you live in the UK, change the date to April 5, and save. Now from the left-hand menu, go to "Accounting" then click a sub menu "Chart of Accounts". Here, you'll set the categories. Types of accounts you have (bank account, debit card account). Types of income (affiliate income, other ad hoc income if you have any), type of expenditure and so on. Notice that there are 5 main tabs (sections) at the top. You'll make a small change to 3 of the sections - Assets, Income, and Expenses. Firstly under Assets. Right at the top under "Cash and Bank", you should only have "Cash on Hand" right now. Add a new account, and add "Bank Account" "PayPal" and "Prepaid Card". When you click "Add a new account", a box appears. Leave Account Type "Cash and Bank" (on all of them) and enter PayPal. Account Currency should be US Dollar because you'll likely to receive your affiliate commissions in USD. 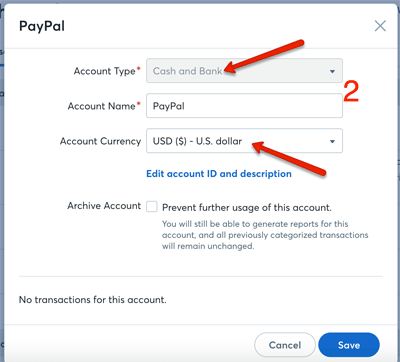 If you receive and pay in your local currency, you also need to create another PayPal account in your currency. Now move on to Income tab. Click this pencil icon again, and change the name to "Affiliate Sales". Under Other Income, add a new account and name it "Other Income" - just in case you have other kinds of income. If you have another source of income regularly such as guest blogging, traffic selling, etc. You can add it specifically. But only if it's your regular income! You'll find quite many types of expense accounts listed there. Delete most of them - delete anything that's unrelated to your expenditure. None of these applies to your expenses, so delete as many as you can and leave only a few (maximum 5) expense categories. 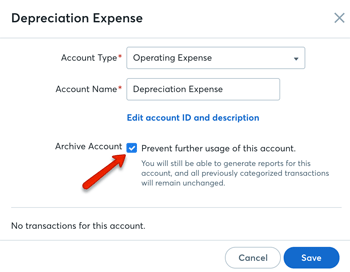 How to delete is to click the pencil icon, then check "Archive Account" box and Save. Seriously, it's so important to minimize the number of categories, because too many categories will make a mess - don't underestimate it! I have seen hundreds (literally) of non-finance managers, colleagues, clients who get trapped in this problem over and over again. They want to create many categories because they want to be precise in the beginning. Then they get confused by the large number of categories, lose interest and end up hating the whole bookkeeping task. I'll give you an example. You say,"I want Google Ad Fees and Facebook Ad Fees in separate categories, because I will want to check how much each service has cost me later on in the year." No, you won't! You will not want to check that. But in 3 months time you couldn't care less. No disrespect but believe me. If you really, really, really want to check, you can go through the transaction history and recategorize them at a later date. You may find some of them missing, because you've misallocated Google ad costs in "Internet General" category and Facebook ad costs in "Website Tools" category and so on... Now, how many categories have you made!? My answer to this is just to create one category for "Advertising/Promotion". In total you'll only need a few expense categories for affiliate marketing. Now your Chart of Accounts is all set! 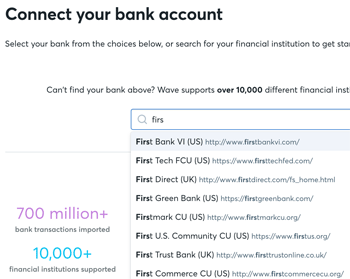 Now connect your Wave account to your bank account and PayPal account. Wave will download all your income and expense transactions automatically (and securely), and all you have to do is to check each transaction, change the description if needed, and confirm. To connect to your bank account: go to "Banking" in the left-side menu, then "Bank Connections". The dropdown menu will find your bank. To connect to your PayPal account: go to "Integrations" in the left-side menu towards the bottom. 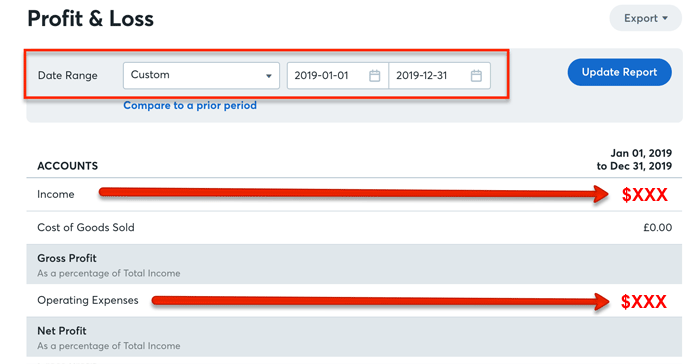 Choose the earliest date of the transaction history you want it to download. That should be the first day of your fiscal year. You may notice the "Integration" feature also allows you to connect to other apps, e.g. if you sell on Etsy regularly, it will make it easy to download your sales transactions. As soon as you connect Wave to your bank and PayPal, it will start downloading all the transactions. Finally! This is what you're going to do - weekly if you can, or monthly at least. Look up the automatically downloaded transactions (income & expenses) line by line and 'review' them. Add other income & expenses (prepaid card use, for example) and review them. 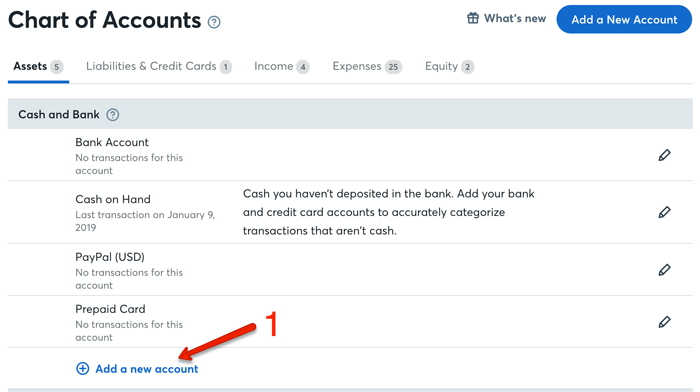 Add any transfer from one account to another (including a transfer to/from your personal account). I'll show you one by one. You only need to link your Wave account to your bank / PayPal once in the beginning. Afterwards every time you log on to Wave, you can connect to your bank and PayPal at a click of a button. The latest transactions (from where you left off previously) will be downloaded. Go to "Accounting" in the left menu > "Transactions". Your latest income and expenses appear there. Like the screenshot below. Amount of each income (=deposit) is shown in green, and each payment (=withdrawal) is shown in black. You need to click line by line to confirm the description and category. 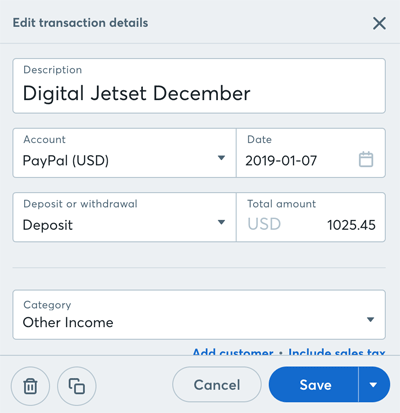 Description: Shown as how it's described in your bank and PayPal statement, you can retype and change it to something more recognizable for yourself. Account: Which account (bank or PayPal) the transaction is related to. Category: It's randomly allocated (most likely to be "Uncategorized Income/Expense") so choose the right category from the dropdown menu. When you've edited the description and category, click Save. Now going back to the transactions... You need to 'review' each line. What it means is simply to confirm each transaction is correct and correctly allocated in the right category. If you have a question (you can't remember what the payment was for, for example), you can leave it for now and review it later. ...Filter out reviewed items by checking "Not Reviewed" and "Apply". So you are left with only questionable items, which you need to find out sooner or later. Find a receipt, email communication on that day, etc. When this section is filtered by "Not Reviewed", there should be nothing left. So next time you log on, all nice & clear, and you can start checking the newly downloaded latest transactions. Now expenses paid on your prepaid card. If your card account allows you to download transactions, that's great. Wave can upload your statement in either Microsoft Money, QuickBooks, Quicken, Simply Accounting, or CSV file format. Top-right corner of your Transaction screen, there's a button that says "Upload a Bank Statement". My prepaid card account unfortunately only allows me to download statement in PDF format. So I just have to manually type in one by one. Then check each transaction and 'review' as explained in #1. I'll give you 3 x examples where you transfer money from one account to another. Still in the "Transaction" screen, firstly go to "More" in the top-right corner and click "Add journal transaction". 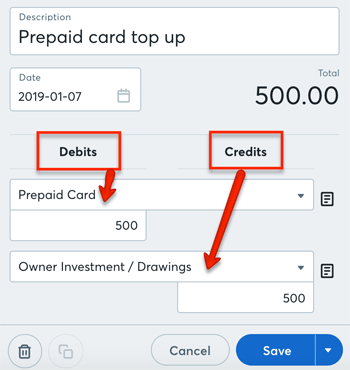 Prepaid card (debit card) needs to be topped up when the balance is low. And you physically make a wire transfer online, right? Here's how you record it. For example you transferred $500 from your bank account to prepaid card account. Remember this. In "balance sheet" - money in your accounts, Debit means Deposit, and Credit means Payment. Just remember like a mantra. "D-D (Debit-Deposit)". So credit is the opposite of D-D, which is Payment. Your bank account gave $500 to your prepaid card account. The prepaid card received a deposit of $500. 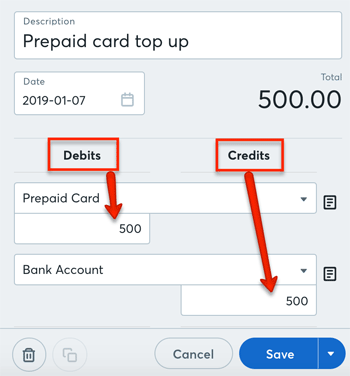 So the top line Debits should be "Prepaid Card" (choose from the dropdown menu), and enter 500. The bottom line should be "Bank Account", and enter 500. Wave can actually record your whole personal account in a separate screen (you may have noticed), but I'll talk about it in another occasion - or you can work it out at a later date. For now I'll explain it simple. You sent $500 from your personal bank account to your prepaid card by wire transfer. The prepaid card account received a deposit (Debit-Deposit). So it goes on the top line. 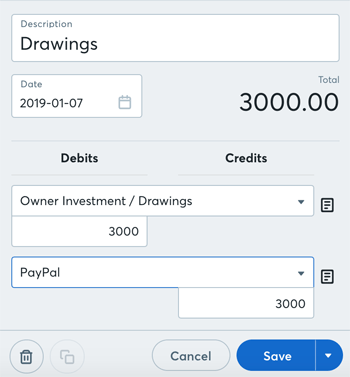 You paid from your pocket, that goes on the bottom line, and the category you're looking for is "Owner Investment/Drawings" - scroll right down the dropdown menu. Now you have some money in your PayPal account and you want to transfer $3,000 to your personal bank account. It's the money that you've earned, you can do anything you want. But it's being transferred out of your business account. It's the other way round now - your personal account (Owner Investment / Drawings) receives $3,000 (Debit for Deposit). It goes on the top line. PayPal pays out $3,000, so it goes on the bottom line. Now all your income and expenses are recorded, how much money you've made so far, how much you've spent and what your net profit is, can be checked at a glance. Go to "Reports" in the left menu (towards the bottom), and click "Profit and Loss". The screenshot above is just an example. I've set the date range from January 1 - December 31, 2019. You'll see the total of income, expenditure and the net profit for the year... That's your bookkeeping sorted! Simply take the figure shown in "Income" line and "Operating Expenses" line and fill in your tax return form. Accrual Basis or Cash Accounting Basis? If you're wondering about "accrual basis or cash accounting basis"... I'll go with cash accounting basis here. Accrual is where related period matters. If you pay for a December membership fee, it should be recorded in your December account regardless to the actual payment date - whether you pay in advance (November) or pay in arrears (January). This is how it should be. But I'll take the cash accounting method. If you pay on January 5th, it's a January expense. Like I mentioned in the beginning, this is not the complete accounts of your business - far from it, in fact. But at least it will indicate your profit or loss clearly throughout the year. If you want to know a little more detail about it, debits/credits, gross/net profit, balance sheet... Any jargon clarifications... Don't hesitate to contact me or leave a comment below any time.